The Samana River. Only 3 hours away from Medellin, immerse yourself for a week in one of Colombia’s most pristine rainforests as few can: by raft. Biologists have confirmed that the biodiversity of this jungle is matched only to that of the Amazon. This fun, multi-day Colombia rivers adventure combines hiking, white water rafting, and even the opportunity to do as the locals do and ride mules! You’ll be received at Medellin’s José María Córdova International Airport before driving 1 ½ hours to your eco-hotel, Tierra de Agua Hotel. 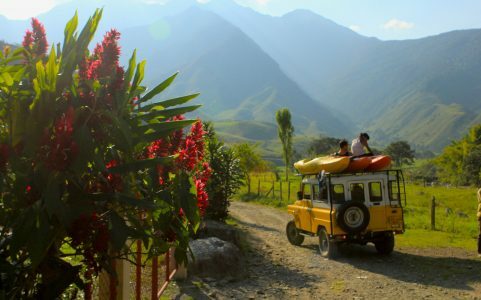 Located in Cocorna, a stunning Andean mountain valley with waterfalls, hikes, and villagers on horseback, relax at your hotel and enjoy traditional cuisine. Stay overnight in comfortable, intricate bamboo cabanas overlooking the forest canopy. After breakfast at Tierra de Agua, hike for around two hours (mules will be transporting your gear). At the river, refresh with a nice swim. Your guide will provide a thorough river safety orientation. You’ll be rafting with a team of experienced guides and safety kayakers on a verdant river surrounded by tropical jungle. Paddle on exciting, yet manageable intermediate whitewater. Visit lagoons, secluded beaches, and narrow canyons as you encounter tropical animals and birds. What also makes these Colombian rivers so unique is how ideal it is for fishing as you can see the fish swim in the translucent water. At night, camp in sheltered hammocks and enjoy Colombian inspired meals cooked on the open fire by the river. Rise early for optimal bird watching opportunities. Wake up with a refreshing swim in the clear jungle river, and enjoy a bountiful breakfast of tropical fruit at camp. Continue rafting the world famous Rio Samana today. The intermediate white-water is exciting, yet manageable, as the major rapids flow into inviting and natural swimmable pools. At the end of the second day, arrive at Puente Samaná, the only road access over the river. Drive 20 minutes to Rio Claro Nature Reserve, a renown ecolodge in the heart of the rainforest preserve surrounded by the marble canyon of the Rio Claro River. Stay in a gorgeous, romantic room suspended over the rainforest canopy. After breakfast at the lodge’s riverside restaurant, enjoy the various activities at the nature reserve (caving, zip-lining, tubing, hiking, etc.). Today, you also have the choice of driving one hour to the town of Prodigio, where you will be greeted by a community-run archaeological preservation group. Here, you’ll be guided to a cave covered in intriguing petroglyphs created by pre-hispanic cultures. Return to stay overnight in Rio Claro Nature Reserve. After breakfast at Rio Claro Nature Reserve, drive 20 minutes to the put-in of the Samaná River, our all-time favorite Expedition Colombia adventure. Get ready for a captivating river escapade packed with natural wonders and 40 km of exhilarating white-water. Expedition Colombia was the first team to pioneer this river by raft and kayak. No prior river rafting experience is necessary as you will be instructed by our expert guides. On your first day on the river, travel through an expansive silver-blue rock canyon. Camp overnight in sheltered hammocks in the rainforest, close to a secluded lagoon and natural swimming pool. After a re-energizing campfire breakfast, continue paddling the Samaná River. Admire tropical plants and birds, and relax with lunch on a secluded beach. Paddle and take out at “Narrises”, a small, quant Colombian village. Enjoy a scenic walk to a waterfall while a traditional fish dish is prepared for you at a local restaurant. Drive several hours to Medellín, the “City of Eternal Spring”, to celebrate in the warm climate and welcoming “Paisa” culture. Stay at a boutique hotel located in the heart of Medellín’s hippest, cosmopolitan neighborhood, El Poblado. Depending on the time of your departure flight, enjoy a trip to Jardin Botanical (botanical gardens) before you are dropped off at Medellín’s José María Córdoba International Airport. Thank you for visiting! Extend your trip by two days and one night to stay at Antioquia’s finest coffee estate at the base of Cerro Bravo Peak. From the stables on the estate, enjoy a one hour horseback ride to the trailhead of Cerro Bravo peak. Leaving your horses at the base of the peak, begin a four-hour hike to a spectacular view of the Andean coffee region from the summit of Cerro Bravo. Return to the coffee estate by horseback to relax by the private swimming pool and enjoy traditional cuisine prepared by the estate’s chef and staff. Get ready for serious, heart-raising physical activity! The more physically fit you are, the more you’ll enjoy these challenging, committing activities. Whitewater rafting is a full body exercise that may require swimming in fast moving water.